↑ Rowlatt, Jason (2 July 2011). 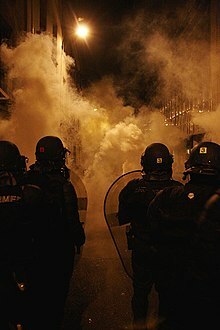 "The 'rituals' of the Greek riots". From Our Own Correspondent. BBC. Retrieved 2011-10-30. ↑ "HowStuffWorks - What does tear gas do?". HowStuffWorks. HowStuffWorks. Retrieved 22 July 2012.